Garmin GPS 72H and 72H bundle (discontinued) marine GPS handhelds float on water! The mariner-friendly Garmin GPS 72H is WAAS-enabled for accuracy to within 3 metres and features a large screen and easy-to-use buttons. Garmin GPS 72H - rugged handheld navigation for your land and sea adventures. The Garmin GPS 72H bundle pack includes extra accessories. These include: marine mount, vehicle power cable and carrying case. 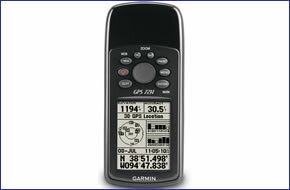 The equivalent and replacement model is the Garmin GPS 73. Don't worry about losing this GPS device in the water. The Garmin GPS 72H floats, and it's IPX7 waterproof to withstand the accidental dunk or splash. Whether on water or land, the Garmin GPS 72H can save up to 500 of your favourite places in memory and point you to your destination (no street or terrain maps). The Garmin GPS 72H is preloaded with worldwide cities as well as marine navigation aids, including lights, buoys, sound signals and day beacons. It also has an extra megabyte of internal memory, so you can load points of interest from optional MapSource disks. If you're into boating or fishing, you can use the Garmin GPS 72's built-in celestial data, which includes sunrise/sunset times and a hunting and fishing calendar.